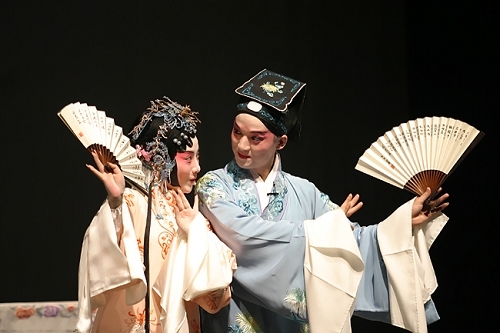 In the saga of selling stripped-down opera to youth, a traditional Kunqu Opera "Peony Pavilion" tells of languishing juvenile lovers, one of whom returns from the dead. The entire cast averages 26 years old. Will that sell tickets? Again and again lovers of traditional operas try to make the refined and complex art forms appealing to young audiences with short attention spans. But youth are not accustomed to turning off their cell phones, turning on their gray cells and sitting still through as many as 55 scenes, elegant areas and following complicated plots and subplots of dynastic court intrigues. Not all aficionados are up to it, either. No matter. Opera lovers are aiming at young brain cells again this month. A brand-new "young" version of the classic, back-from-the-dead love story "Peony Pavilion" will be staged on June 15-16 in hopes of attracting young fans-in-waiting. The lovers in the original opera are 16, the daughter of a high nobleman, and 20, a brilliant young scholar. This cast in the simplified version ranges in age from 13-23 - remarkably young for Kunqu Opera, considered, "the mother of Chinese operas." Often it takes 15 to 20 years to train an accomplished performer.